The few songs this author’s heard from the Catch Me musical score, sent on a promotional disc, are jaunty and fun enough – score writers Marc Shaiman and Scott Wittman, the duo behind Hairspray, certainly know how to make you bob your head – but there’s a soft spot in my heart for the music of the original. Of course, the film wasn’t a musical, but the flick has a rich and underrated musical legacy, as you’ll read in today’s Friday Feature. Fasten your seatbelts, bring your seat backs and tray tables to the locked and upright positions and read on after the jump! The story of Frank William Abagnale, Jr. is the stuff that Hollywood executives clamor over. At age 16, the Bronx teen’s parents divorced, and Frank, obviously affected, ran away from home. For the next five years, he traversed the entire world off the strength of a too-good-to-be-true confidence act: Abagnale looked considerably older than he was, and used a myriad of meticulous tricks to forge checks. In total, he forged some $2.5 million worth during the 1960s, and used his influence to pose under a number of careers, including an airline pilot, a doctor, a lawyer and a college professor. He was finally caught in 1969, and was paroled after five years. In due time, he began an astounding second career (or first, or fifth, depending on how you view it): he began aiding banks in spotting the kind of barely-perceptible cons he so effortlessly pulled off, and today his company, Abagnale & Associates, is one of the leading experts on bank and business fraud, with employers as big as the FBI, the same organization that chased him down through the ’60s. The breezy, period-affected atmosphere of the film was unlike anything the director had done before – an impressive cleanse of palate considering his last film, the sci-fi action Minority Report, had been released only six months prior. Spielberg coaxed some great performances from his leads, including Leonardo DiCaprio as Abagnale, Tom Hanks as Carl Hanratty, Frank’s foil at the FBI and most notably Christopher Walken in an Oscar-nominated turn as Frank’s father and idol. It’s DiCaprio and Walken’s relationship that gives the film its emotional core – no surprise given Spielberg’s real-life estrangement and reconciliation with his divorced dad, signified artistically in Close Encounters of the Third Kind and E.T. 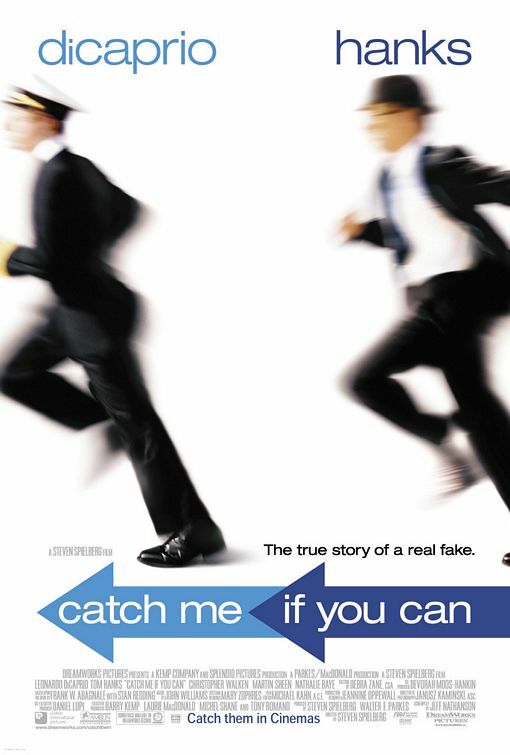 Catch Me If You Can provided one of the most shining collaborations between Spielberg and his nearly-permanent composer, John Williams. For the Oscar-winning composer, the film was something of a musical homecoming; before JAWS and Star Wars made him a household name and revivalist of great orchestral scores, “Johnny” Williams was leading orchestras in light, jazzy scores to Valley of the Dolls, Bachelor Flat and How to Steal a Million. (He also played piano for several classic scores by Henry Mancini, including Charade and the unmistakable Peter Gunn!) For the film, Williams composed a breezy, mock-sinister theme for Abagnale on low woodwinds, intercut with bouncy, sax-based jazz breakdowns. The theme for Frank and his father was a slow burner, dominated by saxophone and full of every bit of warm ache that the divorced Abagnale patriarch conveyed. The soundtrack was also the first Spielberg-Williams disc to share space with pop source music. The great original version of Frank Sinatra’s “Come Fly with Me” is featured, as is another film classic (“The Look of Love” by Dusty Springfield), Nat “King” Cole’s heartbreaking “The Christmas Song” (used to perfection in a scene where the Abagnale escapes federal custody and attempts to reunite with his mother) and others. While fans would always love to get more Williams on CD, the Catch Me soundtrack is a blissfully arranged album. An Oscar promotional CD was released by DreamWorks in late 2002. It has no catalogue number and removes the five pop tracks, but features no extra score.